Cinnamon is definitely one of my favourite things on the entire planet. Any excuse to incorporate it into food is a welcome one. For it the be the hero of the dish, so much the better. I've been wanting to try these for ages, but every time I went to make them, I wouldn't have enough sour cream. When I went shopping and bought sour cream, I could never remember what I wanted it for so would use it for dinner instead. Rinse. Repeat. This time I remembered. Yay! Now I can finally share them with you. These twists are super easy. 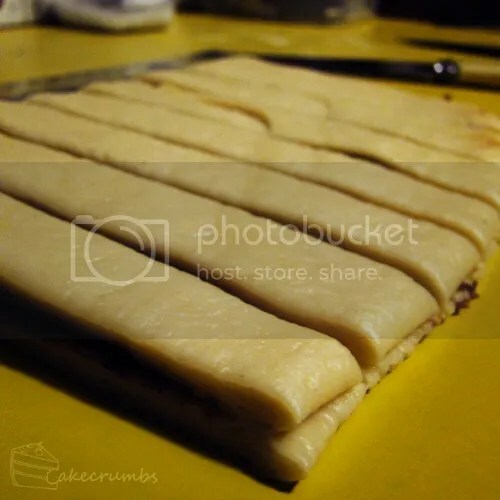 All you have to do is spread the filling over your dough, fold in half and cut. 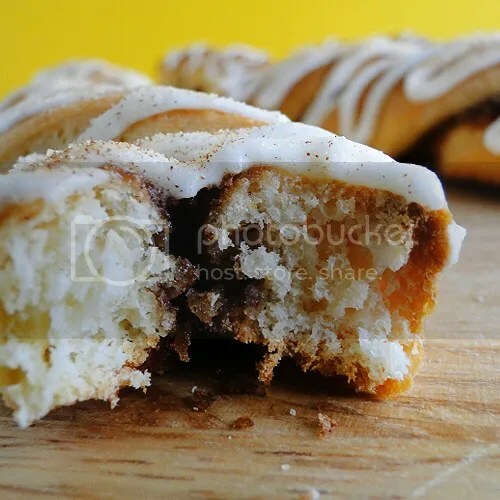 A little twist of each end gives that lovely cinnamon swirl. They're nice enough just like this. They're definitely sweet enough, as long as you don't find a bit that's missing filling. We certainly nommed quite a few of them right out of the oven. Half of them never made it to the icing stage. But if you're a sweet tooth, or manage not to eat the entire batch right out of the oven, you can drizzle a little icing on once they've cooled down. Combine dry ingredients (including yeast) in a large mixing bowl. Make a well in the centre; add wet ingredients. Mix well to form a soft dough. Knead dough for 10 minutes, until it becomes smooth and elastic. Place dough in a lightly greased bowl, cover with a tea towel and leave in a warm place for an hour to double in size. Punch down dough; knead for one minute. Mix filling ingredients together until well combined. Divide dough into two equal portions; roll each potion into a 30x30cm square. Spread evenly with filling. 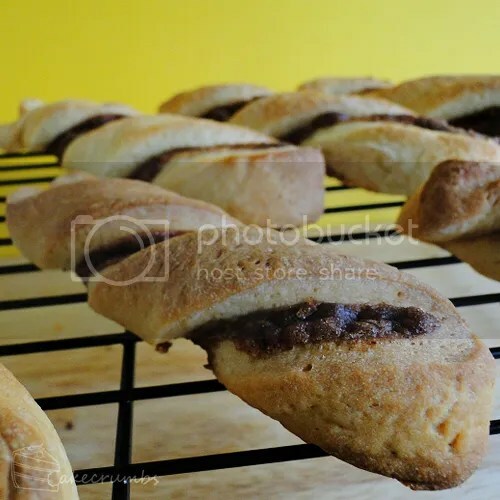 Fold dough in half; cut into slices at 2.5cm intervals. Twist ends in opposite directions and place on a greased baking tray; leave in a warm place to double in size (approximately 30 minutes). 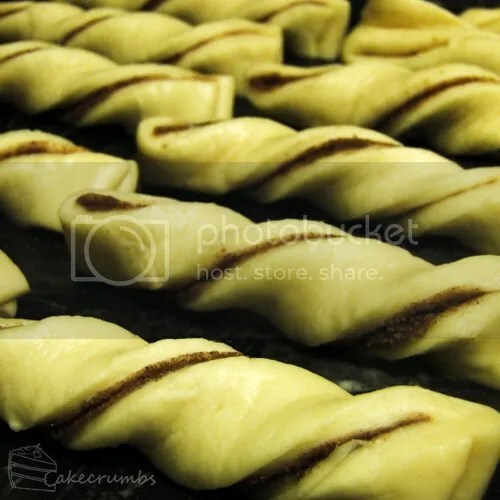 Bake at 180°C for 20-25 minutes. Cool on wire rack; ice and sprinkle with cinnamon sugar (to make icing, beat butter and icing sugar and essence together until light and fluffy, then beat in milk). NB: Yeast that comes in individual sachets is near fool proof: rarely will you get a dud batch. However, if you are using a large container of dried yeast that had previously been opened, or just want to be safe, you can proof it by adding it to the warmed (NOT hot) milk with a pinch of sugar: if it froths, your yeast is alive. Those photos make them look very enticing! I’m very tempted. 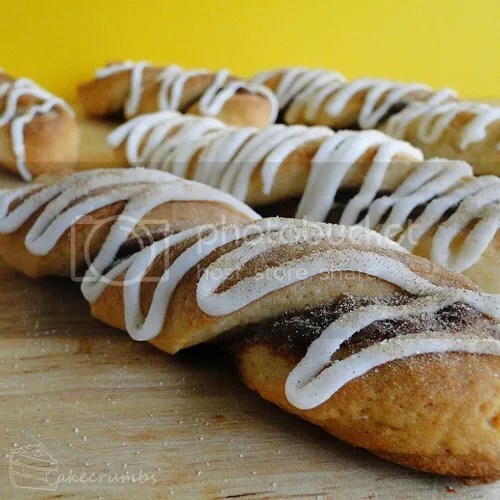 Your cinnamon twists look delicious!!! I followed your link from the Daring bakers to check out your crackers you had posted in the forum. Your blog is amazing!! 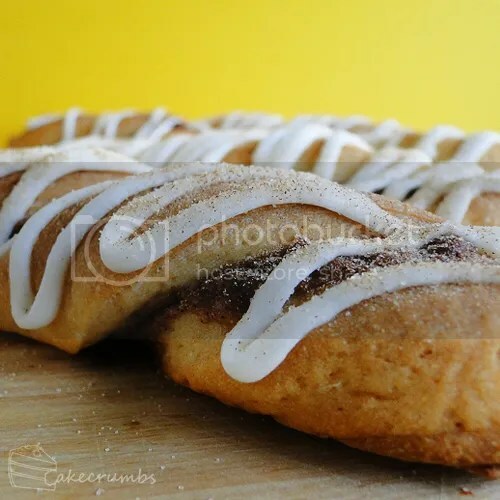 I will be making these twists and by the looks of your blog many more delicious treats!! Oh thanks so much. I’m super late in posting the challenge. Just about to edit the photos and post now, eek! Thanks for swinging by! These look delicious! DL-ing the recipe. Thanks! these twists are perfect ! i want to make them but am not sure if i can get sour cream 😦 isn’t there any substitute ? You can substitute 1 cup sour cream for 7/8 cup buttermilk/sour milk and 1/8 cup butter. You can make buttermilk by adding 1tbsp of vinegar or lemon juice and letting it sit for 15 minutes.